Whitehouse Landscaping’s Tree and Shrub Care program provides everything your trees and shrubs need to remain healthy. A healthy plant will be less susceptible to insect and disease damage and will promote greater bloom and color growth. Forests have incredible organisms within the soil that enhance soil structure, store water and nutrients, decompose organic matter, and make nutrients available to plants. Unfortunately, the soil in our yards has been bulldozed and disturbed over the years and is missing those critical organisms that foster healthy trees and shrubs. Our Plant Health Care Program proudly uses Holganix, a 100% bio-nutritional product that restores the proper balance of organisms to your soil. Our 6 Visit Tree & Shrub Program builds up the microbiological life in the soil, promotes root development and nutrient uptake which supplies optimum opportunity for plant growth. Our custom program inspects first then treats based on what we see. The Emerald Ash Borer (EAB) infests and kills ash trees. This invasive pest destroys the tree's transport system under the bark, cutting off the flow of water from the roots. Infested trees typically die within 3 years without treatment. Whitehouse Landscaping can determine your risk as well as if your trees may have already become infected. 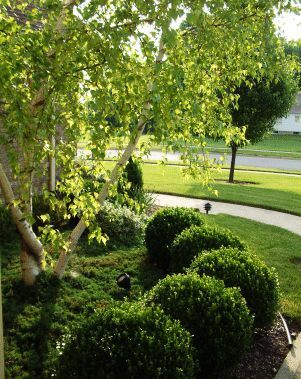 We can create a custom program that best suits your needs, insuring the health and vitality of your trees and landscape. ​Save your trees against this invasive pest. Help control the spread of this destructive bug by scheduling a control visit. We can help you control any Spotted Lanternfly infestations with effective methods of treatment. Read our blog for additional information.